Myocardial ischemia following arterial switch operation (ASO) is usually secondary to imperfect transfer of the coronary arteries to the neoaorta. We report an unusual case of myocardial ischemia caused by unrecognized major aortopulmonary collaterals (MAPCAs). There are reports of aortopulmonary and bronchial collaterals causing ventricular dysfunction, pulmonary edema, failure to wean from ventilator and prolonged ionotropic dependence after ASO. ,,, To the best of our knowledge, MAPCAs causing myocardial ischemia have not yet reported. A 23-day-old neonate was admitted with dyspnea and cyanosis (SpO 2 -30%). She was diagnosed to have D-transposition of great arteries (TGA), restrictive patent foramen ovale, intact interventricular septum, unregressed left ventricle and normal coronaries for TGA. An emergency balloon atrial septostomy was performed. Subsequently, the child underwent ASO on 27 th day of life. The cardiopulmonary bypass time was 196 min and the cross-clamp time was 88 min. She was hemodynamically stable and had an uneventful ICU stay. ECG done in the ICU on the 3 rd postoperative day was normal. ECG done on the day of discharge (7 th postoperative day) showed elevated ST segment in the I, aVL and V2-V5 leads. Echocardiogram showed normal flow in coronaries and good ventricular function. Troponin I was elevated to 0.31 ng/mL (normal <0.1 ng/ mL) and CK-MB was 27 IU/L. The child was clinically stable and it was decided to follow her closely. ECG repeated after 1 week showed more marked ST elevation in the same leads [Figure 1]. Troponin level had dropped to 0.07 ng/ mL. The child remained stable with normal ventricular function. Hence, no intervention was done and she was followed-up. When reviewed after 1 month, the baby was symptomatic with poor weight gain and occasional episodes of incessant cry. She had a wide pulse pressure (BP 106/40 mmHg). ECG showed new-onset ST segment depression in right-sided leads (V3R-V5R) and inferior leads III and aVF with pathologic q waves in inferior leads. ST elevation in V2-V5 had resolved [Figure 2]. An angiogram was done to look for coronary pathology. Selective right and left coronary artery injections revealed normal coronary artery flow with no evidence of obstruction [Figure 3]. There was a small fistula from right coronary artery to right atrium. Aortogram showed two to three collaterals arising from the descending aorta. There was one significant collateral, 2-3 mm in diameter, arising at the D4 level supplying all three lobes of the right lung [Figure 4]. The collateral was coil embolized using a 3 cm × 2 mm stainless steel coil. 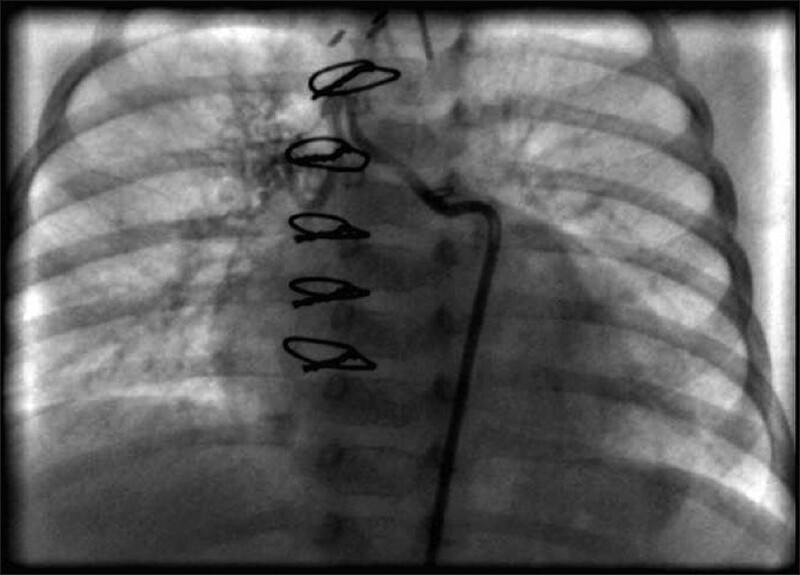 The other collaterals arising at the D5 level were stenosed at origin with insignificant lung supply and hence were left alone. No intervention was done for the coronary fistula. At review after 4 weeks, the child was asymptomatic with good weight gain. Her pulse pressure was normal (BP 100/70 mmHg). Her ECG showed resolution of ST segment depression in right-sided leads, but q waves in the inferior leads persisted [Figure 5]. She had normal ventricular function on echocardiogram with no regional wall motion abnormality. The prevalence of coronary events following ASO varies from 2% to 11%. Residual tension, injury to the wall of the coronary artery during surgical dissection and ostial distortion are the most common predisposing factors for proximal narrowing of the coronary arteries resulting in myocardial ischemia. In our case, ischemia occurred in the absence of any such surgical complications. Abnormally enlarged collateral arteries are frequently identified at postoperative catheterization after ASO despite early repair, and may explain continuous murmurs or persistent cardiomegaly in patients with otherwise normal noninvasive findings. Occasionally, these MAPCAs can complicate postoperative recovery causing pulmonary hypercirculation and ventricular failure, necessitating coil embolization for the collaterals. ,,, In our case, the MAPCA could have caused the coronary steal resulting in features of myocardial ischemia, although it cannot be proven. The reasons for the hypothesis are discussed further. Gurkan et al. reported a case of a neonate who presented with ischemia and ventricular failure after 10 days of ASO. The child improved after coil embolization of a previously unrecognized coronary fistula between circumflex artery and right ventricle. In our case, the child had a small coronary fistula and significant MAPCAs, both contributing to the coronary steal. It was decided to embolize the MAPCA first and address the coronary fistula later if necessary, as the latter is technically more challenging than the former in a young infant. The child improved after coil embolization of the MAPCA. The blood flow through the MAPCA would have been minimal in the preoperative period due to high pulmonary vascular resistance (PVR) of the neonate. When the PVR decreased, an increase in the blood flow through the MAPCA caused a diastolic run off resulting in coronary steal, manifesting as myocardial ischemia. The changing pattern of ischemia on ECG supports the fact that it was not an anatomical obstruction, and reflects the variation in coronary steal with changes in systemic resistance and PVR. Although there are no case reports on MAPCAs causing coronary steal, it is a well-established fact that a diastolic run-off caused by any form of aortopulmonary shunt can result in coronary hypoperfusion. Simon et al. reported the case of a fatal myocardial ischemia in a preterm neonate with patent ductus arteriosus (PDA). They demonstrated myocardial ischemic changes on autopsy and attributed it to the coronary steal caused by PDA. Harada et al. demonstrated that the maximum peak flow velocity and left anterior descending artery flow volume increased after PDA coil closure. Similarly, there are reports of coronary hypoperfusion following Blalock-Taussig shunts. 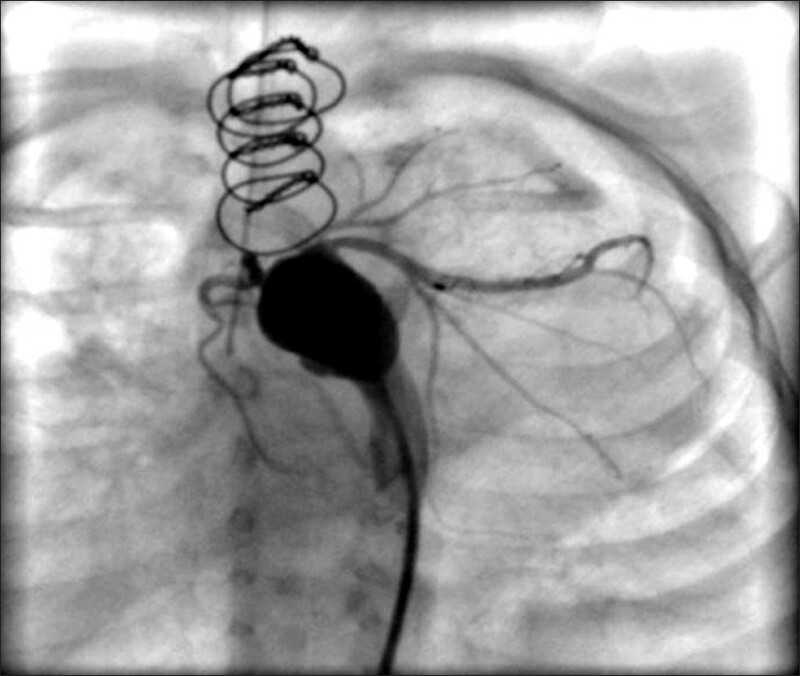 Coronary steal caused by shunt after the Norwood procedure is a known entity. To the best of our knowledge, coronary steal caused by MAPCAs have not yet been documented. Preoperative angiography is not routinely performed in D-TGA as the morphology is accurately demonstrated on echocardiography. Hence, MAPCAs can remain undiagnosed in TGA. Screening for collaterals by echocardiogram or angiography may be considered when there are unexplained postoperative complications. 1. Irving C, Chaudhari M. Enlarged bronchial collateral artery complicating recovery after arterial switch for simple transposition of the great arteries. Interact Cardiovasc Thorac Surg 2008;7:1176-7. 2. Wernovsky G, Bridges ND, Mandell VS, Castañeda AR, Perry SB. Enlarged bronchial arteries after early repair of transposition of the great arteries. J Am Coll Cardiol 1993;21:465-70. 3. Aghaji MA, Friedberg DZ, Burlingame MW, Litwin SB. Hypoxemia and pulmonary hyperperfusion due to systemic collateral arteries after total repair of transposition of the great arteries. J Cardiovasc Surg (Torino) 1989;30:338-41. 4. Santoro G, Carrozza M, Russo MG, Calabrò R. Symptomatic aorto-pulmonary collaterals early after arterial switch operation. Pediatr Cardiol 2008,29:838-41. 5. Raja SG, Shauq A, Kaarne M. Outcomes after arterial switch operation for simple transposition. Asian Cardiovasc Thorac Ann 2005;13:190-8. 6. Cetin G, Saltik L, Ozkara A, Babaoðlu K. Unusual presentation of myocardial ischemia after arterial switch operation. Eur J Cardiothorac Surg 2005;27:518-9. 7. Fluri S, Pavlovic M, Wagner BP. Patent arterial duct, bottle-meal and fatal myocardial ischemia. Cardiol Young 2010;20:108-10. 8. Harada K, Toyono M, Tamura M. Effects of coil closure of patent ductus arteriosus on left anterior descending coronary artery blood flow using transthoracic Doppler echocardiography. J Am Soc Echocardiogr 2004;17:659-63. 9. Fenton KN, Siewers RD, Rebovich B, Pigula FA. Interim mortality in infants with systemic-to-pulmonary artery shunts. Ann Thorac Surg 2003;76:152-6; discussion 156-7. 10. Ohye RG, Sleeper LA, Mahony L, Newburger JW, Pearson GD, Lu M, et al. Comparison of shunt types in the Norwood procedure for single-ventricle lesions. N Engl J Med 2010;362:1980-92.